"Let’s Stay Together" is a single from Tina Turner's album "Private Dancer". It’s a cover version of Al Green. Al Green released the song in 1971 for the album "Let’s Stay Together". The song was written by Al Green, Willie Mitchell and Al Jackson Jr.
Tina’s career was hanging by a thread from 76-83. Her previous solo albums flopped and the record labels didn’t want to work with her. She was considered too old or they still held her responsible for her working with Ike. Tina’s live shows were always a success. She was mostly on the road and entertaining people from cabaret shows to rock shows. However her manager Roger Davies didn’t gave up on Tina when he heard that she was abandoned again by the record label. Roger called Martin and Greg of Heaven 17 again after they worked together on the cover version "Ball Of Confusion". He asked if they were interested in writing songs for Tina or if they had any other ideas. However they told Roger, that in general they didn’t write songs for other artists, and certainly not for Tina. Not that they didn’t like her, but they adored her too much. She was a legend in their eyes and they weren’t confident at all to write songs for Tina. Roger and Tina were already staying in London, and the Heaven 17 member came up with the idea to cover another song they surely would love to hear Tina sing. They also knew Tina wanted rock songs but they also said she was an amazing soul vocalist and if she would be interested covering a soul song. Soul is Tina!! They’ve asked if she had any soul idols and Tina came quickly up with a list of soul performers. Sam Cooke, Wilson Pickett and Otis Redding. How about Al Green’s "Let’s Stay Together"? Tina immediately jumped at the idea. Tina hadn’t trouble recording the song, and they used the first take. They were stunned. 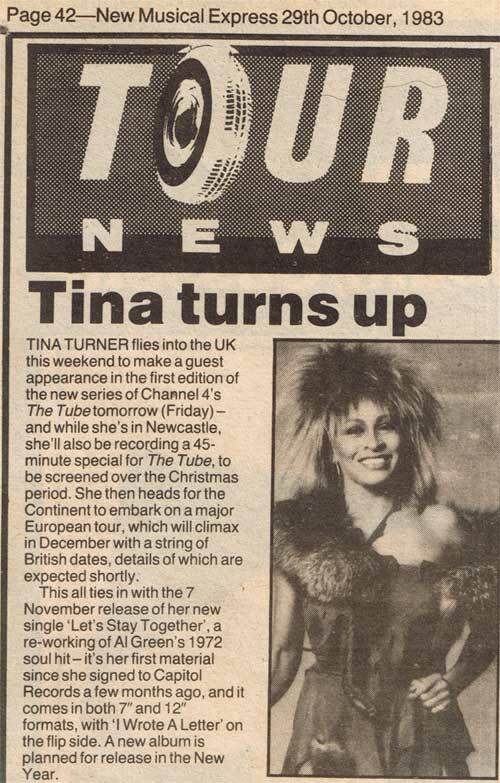 Here’s a video of Tina and Heaven 17 live at The Tube in England. The song became a huge hit in Europe and even climbed up in The Billboard charts in the USA. "Let’s Stay Together" was the comeback single for The Queen. Things finally went in the right direction for Tina. Later on there was a meeting with Capitol and David Bowie. They were at a dinner party for releasing Bowie’s new album. The company asked if Bowie had any plans tonight because they wanted to invite Bowie. He said "No, I won’t be able to make it tonight. I’m going to see my favourite singer tonight. "Oh well’’ they said. "Who is this favourite singer?’’ Bowie said "Tina Turner’’. They were surprised because they just dropped her. However the company decided to come along with Bowie to see Tina performing live. They already noticed that Tina had a hit record on both sides of the ocean and immediately re-signed her. They also put the pressure on Tina because they wanted an album and gave her a deadline of a few weeks. Tina often thanked Bowie for helping her. Tina’s career came in movement because of Bowie. The Queen was back!!! 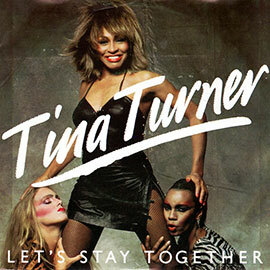 Tina performed "Let’s Stay Together" in multiple shows. Solid Gold, Banana’s and Na Sowas are a few examples of them. "Let’s Stay Together" never left her live shows as well. Although she made changes every now and then, it always was an incredible moment when audiences sang along with The Queen. She performed the song from 1983-2009. Half the original recorded version and the second half of her career as an unplugged version. Tina received The Kennedy Center Honouree in 2005 and Al Green, the original singer of the song tributed the song to Tina during her honouree. He always loved her version of the song. The single was released in 1983 in 7’’ single version, 12’’ single version and 12’’ picture disc. 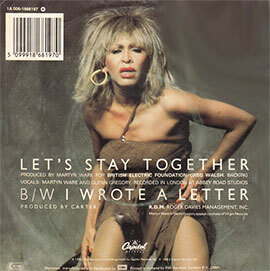 The B-side was "I Wrote A Letter", a rock song from Tina, written by Inga Rumpf and produced by John Carter. The B-side was released at re-issued versions of the "Private Dancer" album in 1997 and 2015. "I Wrote A Letter" is about a woman who writes a letter to her man, because he has left her and she doesn't know why. So she asks him to tell her what is wrong, because she can't live without him. There’s also a hot tracks remix of the song.